Glad you asked. It’s a smarter way to get around the city. Drive cars by the hour or day. Gas & insurance included. In neighborhoods, cities and airports across the globe. Save hundreds over car ownership. Choose from sedans, hybrids, vans and more. Membership starts as low as $6/month. 4 simple steps to Zipcar freedom. Apply now! Once approved, you’ll get your Zipcard. This magical, little card unlocks thousands of cars, trucks and vans across the globe. 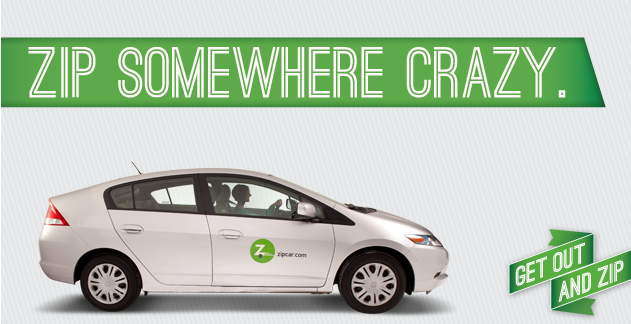 Book a Zipcar for a couple hours or the whole day. Do it online or on your phone via our mobile app. We’re easy. Walk to the car and hold your Zipcard to the windshield. Ta da. The doors will unlock and it’s all yours. Go! When your time is almost up, return the car to the same reserved parking spot. Then you are all done! Congruence with Trends and Principles: A different model of car rental for urban environments, and a movable feast for the sharing economy.